Have composed a poem on Sri Arunagirinathar. Originally thought of publishing it in the forthcoming Amritha Varshini. But i thought today will be the most appropriate day as today is the Birthday of our Guruji Sri Raghavan coupled with Kritthigai Star which is a special for the devotees of Lord Muruga. I dedicate this poem to all the Anbars and Adiyars who had sacrificed their life to collect the sacred Thiruppugazh like Thanigaimani Cengalvaraya Pillai, who followed his father's footsteps, Vallimalai Sri Sacchidananda Swamigal, Sri Krupanandavariyar, Pithukkuli Sri Murugadas, Andavan Picchai, Thiruppugazh Sri Mani, Guruji Raghavan and many more such devotees have spent their life mission for This immortal Thiruppugazh. Smt Chitra Murthy, Smt Uma Balasubramanian, (daughter of Sri Ki. Va. Jagannathan), Sri N.V. Vaidyanathan, and many more such Anbargal are carrying forward the torch handed over from such great devotees. I thank Sri Jawahar Kannan, Sri O.N. Ravi and Smt Shanta Rajan for reading and sharing their feedback. I wish to make special thanks to Sri V.S. Krishnan mama and Smt Uma Balasubramanian who gave me valuable inputs in taking shape of this poem. Will be happy if this gets circulated to all the Thiruppugazh Anbargal. The objective of this poem is to share the greatness of Sri Arunagirinathar and his immortal Thiruppugazh. I offer this poem at his feet. If there is any mistake kindly pardon me. If it sounds good the credit goes to Sri Arunagirinathar and Lord Muruga. May Guruji, Guru Arunagirinathar, and Guruguha bless us All. Absolutely brilliant and published at very appropriate timing ! அருமையான குரு வந்தனம் ..குரு சமர்ப்பணம் . Many saints and sages have described Thiruppugazh. Some said that it is a vast ocean where one can procure precious stones and pearls of knowledge. It is a Jnanamrutam, said Sachidananda Swamigal. One who sings Thiruppugazh is elevated to a state of infinite bliss. “It is a Ganamrutam”, said Guruji Sri Raghavan. “It is a Maha Mantra”, said Seshadri Swamigal. “. It is an Amritavarshini. It pours the nectar of immortality, said Sri Ravi Sastrigal. It is a Maha Aushadam” said a devotee who found his diseases miraculously cured by singing songs like Irumalum Roga. “ It ensures our welfare not only in this world but also in the celestial world (Ika Para Soubhagyam Arulvaye)”, said Sri Narayanan, another devotee. There is no doubt that each and every definition is true because Thiruppugazh has given different experience to different people. In short, Thiruppugazh can be known only by experience. It is an experience; a divine experience that will take us to the state of Sath Chith Ananda (Truth Conscioussness and Bliss). I find that a Thiruppugazh wave is sweeping across the country and more and more young people are taking interest in learning Thiruppugazh and following the Thiruppugazh way of life. I wish to congratulate Anand Vasudevan for his excellent poem on Arunagiri. What somebody else has said in volumnous book, he said it in few lines. Wonderful. Especially, I found the line starting “Alaipayum Manathai Odukki”. 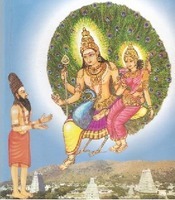 By showing the way to win over the mind by means of “Summa Iru”, Thiruppugazh shows the way for liberation (Mukti). Few words but vast meaning. By these verses, Anand Vasudevan has emerged as a poet of high vision, excellence and brilliance. We expect more such poems from him in future. I read the poem. Thank you for sending this first this morning. I can not put it in words- the experience. The homage to Arunagirinathar is simply elevating; Yes, it is like Panchamritam his Thirupukazh and its spiritual undertones have far reaching effects on human beings. Thanks for sharing those thoughts with all. Your poem is extremely good and very soothing to read. it elicits all the important aspects of Sri Arunagirinathar's works. ​shall we expect more new age poems like this from your pen?